Yay for the weather actually starting to act like Summer! Let's reflect on the past week . . .
. . . I had a bunch of really weird dreams! From seeing giraffes out of my living room window to Russell Brand taking me out to dinner to having beans & avocado on toast in a restaurant and being charged £70 for it. What's that all about?
. . . I was so happy for Ingrid! I've been watching her channel for years and for her now to be able to be completely and unapologetically herself is such a wonderful thing. If you didn't see her video you can watch it here!
. . . I watched quite a few good films; The Breakfast Club, 10 Things I Hate About You & Get Him To The Greek!
. . . my family and I went out for dinner on Friday night! We went to our favourite Indian restaurant and I had a delicious Kora-hi curry. 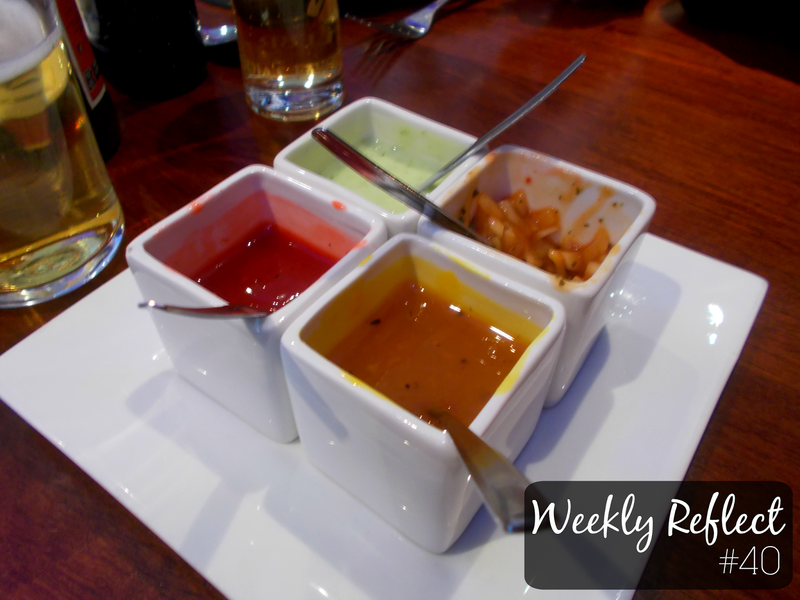 The photo above is of the delicious poppadom sauces!